Círculo is a safe space for women journalists to support each other as they face online harassment and violence in their work. The situation for women in Mexico is dangerous and even more so for journalists. 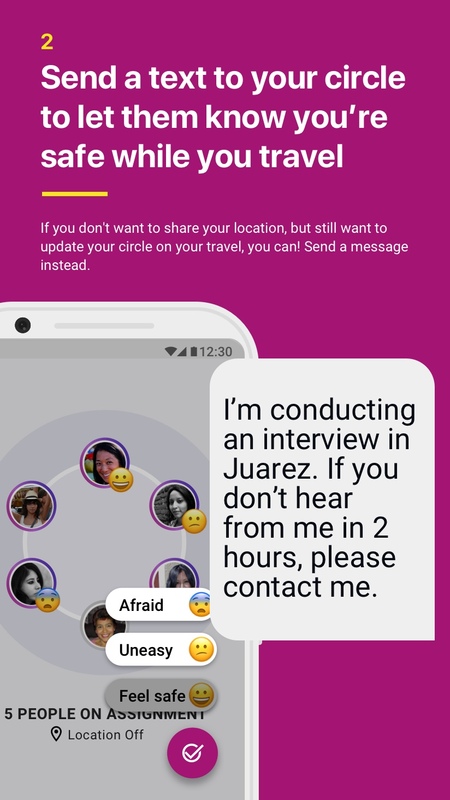 In partnership with Guardian Project and Article 19, we've explored how Circle of 6, a safety app for university students, could be used to benefit women journalists in Mexico. Our aim was to create a safe outlet where women feel comfortable expressing concerns and are motivated to help each other. The two biggest challenges to address were limiting the cost of sending messages and protecting the privacy of the journalists in dangerous environments. The original Circle of Six sends an SMS message to everyone in the “circle” of the user when triggered. In Latin American countries, data and phone plans, we learned, are very expensive and have limited SMS messages to be sent each month. Not to mention, many journalists are regularly traveling to rural areas of the country where they have no internet connection at all to send or receive messages. On top of the monetary cost of connectivity, the Mexican government holds control over messages sent within its country, leaving the citizens vulnerable, and desiring end-to-end encrypted messaging services such as WhatsApp. While the original Circle of Six app sends SMS messages to contacts, the premise of the redesign is to be a space to share status updates. All members of a circle have the app, and receive notifications when others in their circle post updates. While the app itself is end-to-end encrypted, we also designed the ability to reply to someone's status with the user's preferred installed messaging app (ie: WhatsApp, Signal, Line). Because the journalists using the app need to be able to send their location so others can reach out and help or come find them, they need to be able to send their location to their circle. However, for fear of the governments control in seeing their data as well as the battery life and data drained by location tracking, location sharing needs to be 100% optional. The only time that a location will be shared, is when a user consciously selects “Share Location” while posting an update to their contacts. The native Android Operating System prompts the user to allow the app to use their location, so nothing is ever happening without the user being aware. After interviews, research and conversations with Article 19, we created case profiles outlining potential uses of the app in Mexico. Based on the case profiles and further research, we created concept mockups to characterize the user experience. Within a WhatsApp group, our colleague facilitated an ongoing conversation with journalists. We asked the journalists to rate each concept based on its usefulness to them. With the feedback from the journalists, we built out a paper prototype, printed several copies, and presented it to a workshop of women journalists in Mexico City to receive face-to-face feedback. The response was overwhelming, and while we're still presenting prototypes and beta versions of the app wherever we can, the app is nearing the end of development for public deployment.